I don’t hate the weather. I just can’t stand talking about it. 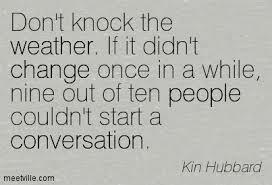 How are you at talking about the weather? I’ll be the first to admit – I’m not very good at it. Whenever someone brings up this topic, of all topics, I’m quietly annoyed and stumbling for words. Especially if it’s the fifth weather rant I’ve heard that day. I completely understand it’s the go-to topic when starting conversations. And we do need openers. But at the risk of sounding completely anti-social and psychotic, I do like other conversation topics. And I don’t avoid people altogether. Even the weather-haters. I think what frustrates me is the perpetual ‘small talk’. And I know I might be in the minority here. But I blame it on my fraught, melancholy, INFJ personality. I’m just not good with the standing-around-chatting-about-this-and-that-thing. Unless we’re talking food… Then, I will talk all day. So yeah, I can be shallow too. I think I just have a propensity towards over-sharing – ponderous thinking, if you like. And I realise that can get boring too unless you’re just like me. Maybe that’s why I need a blog to get it all out. I really do prefer the ‘how are you really‘ question to the ‘how are you’. I want to talk about life, and relationships, and struggles. I want to be real, authentic, truthful – even if I don’t always live up to this ideal. And sometimes I just want to sit in silence with you. And be OK with that too. We’re all designed for relationships, as complicated as they are. We might, for a while, convince ourselves we don’t need them. But friends are like ventolin to an asthma sufferer. We need to connect with our ‘puffers’, or we die inside. Next What’s your ‘starfish story’? Haha, Caddo, I love that we’re each, truly, so unique! I must say, most of the people in my life are ‘jabberers’. I do love the steady stream of words, because I think it makes up for my quietness and ponderousness 🙂 Heehee, that has brought a smile – and I don’t think we should ever make apology for our delightful, God-created personalities! I don’t apologise for my inability to talk about the weather, haha! I sometimes think I’m making up for lost time–I didn’t talk much in the first half of my life. Thanks Ali, It’s nice to know that I am not totally unique on this. I was also thinking about why people stay at the shallow level and even in my own life I see it’s because of fear at times. Fear that the other person will not except the deep side of me. Fear to really express the things I am really passionate about because I would be judged! But with all that said we need to be real and transparent. People are supposed to leave feeling better or inspired because they spoke to us. And yeah, from experience there is a lot of scepticism about ‘deep talk’. Nicely said – yes, I would love to think people leave a conversation with us happier/better/more inspired. And being real makes a bigger difference, I think, than the small talk. Then again, I guess relationships have to progress slowly. We don’t all have ‘d&ms’ on the first meeting. And not everyone we meet, do we want to talk on that level with. Which makes it that much more special when we do find that deeper connection! That’s right Ali…..! Have a great weekend. I’m not good at small talk, but the sky is so blue and the white clouds are extra puffy today. Yes, I’m that person described in Hubbard’s quote. But I’m a good listener, too. Haha! I think it sounds like you’re multi-talented. Honestly, even though I’m cynical about it, I wish I was much better at the small talk! Well done on avoiding those situations. Aren’t big, noisy parties the worst! It’s OK if you find someone to chat with that you really connect with – otherwise it’s torture, in my experience. So true… Some days when people ask me how I’m doing, I think, I wish I could tell you how I really feel. I wish I could explain the struggles I’m going through. But the closest I get to that is saying Okay instead of Good. This life would be very different if we could just share what is on our hearts, instead of feeling the need to hide how we really are. Ah yes… And the weather. Okay, for me, is definitely code for ‘I’m stressed/depressed’. Yeah, hiding ourselves creates more stress I think. Haha, yup, totally! Hate those awkward silences!!! Hi! Found this post interesting =) Especially after an incident with a friend this year, who said to me that one should not ask questions of their friends, but just talk about superficial stuff. She doesn’t want to be asked anything! Wow, she’s not backwards in stating how she feels! Yeah, I would die inside as well. That’s awesome that she is opening up in response!! People often don’t open up unless we do first I’ve found. Glad you can relate Denise! I recently started blogging for the same reasons you mention above! I am not a fan of small talk either, yet there are times when it is appropriate, and I dread those times if it has to last more than 5 minutes. I love going deeper, but only a few can go there with me. I’m glad I found your blog. I’ll be back!